This week the Go Creative show is focussing on probably the most contentious subject in video journalism right now – drones. 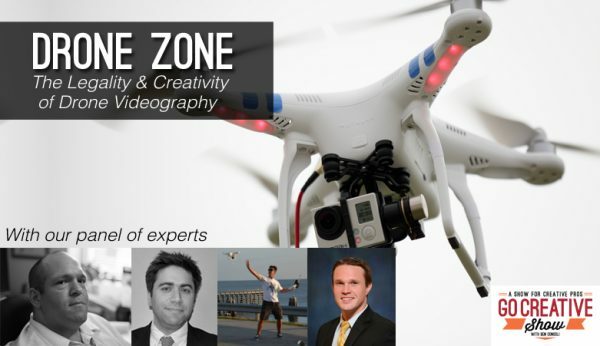 Host Ben Consoli has a great lineup of guests to discuss the practicalities of drone filmmaking and also the legal issues surrounding their use in the United States. Jos Stiglingh the creator of the viral video “Fireworks filmed with a drone” talks about how he created it and how it came to get several million view. Filmmaker Paul Antico talks about he uses the DJI Phantom 2 and H3-3D gimbal to get professional results. Also on the show are two lawyers, Matt Saunders, a copyright attorney who discusses the legality of drones and the copyright issues that go with it and Jonathan Rupprecht, an attorney, commercial pilot and unmanned aircraft consultant that discusses the current FAA regulations. DJI Phantom 2 Zenmuse H3-3D 3 Axis Gimbal: The Anti-Jello Real World Review from Anticipate Media on Vimeo.